← Attack! Attack! Attack! Lessons of a Futsal Coach. Nokosi the little bear, originally uploaded by stephenchukumba. 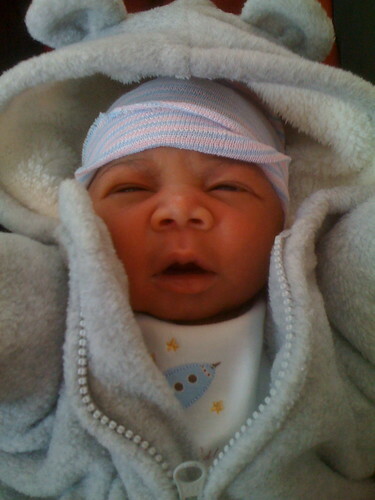 My son, Nokosi Dike Fuji Chukumba was born Tuesday, January 26th, at 7:25 p.m. at Morristown Memorial Hospital. He came in to the world at 8 pounds, 5 ounces, and 20 and 1/2 inches long, and a head full of hair. Nokosi, means ‘little bear,’ in Seminole. Chanel and I came up with this name six years ago, when we had our first son, and I tricked her into thinking I’d name my first son other than ‘Stephen’ (silly girl). So we’d had the name on stash for a minute. Dike, means ‘one who is strong,’ or ‘one with strength’ in Igbo (Nigerian dialect). But it can also be translated as ‘a gentlemen.’ In the Nigerian tradition, a child is named by the eldest member of the family (in this case, my father). So as soon as the baby was born, I dialed pop-dukes and asked the name of the newest addition to the Chukumba clan. Fuji means ‘wealthy intentions’ as is most commonly associated with Mount Fuji, the mountain in Honshu, Japan. Fuji was the name given by Duran, our 3 year old, and what the kids have been calling the baby the last two months of the pregnancy. We liked it so much it stuck. Chukumba, means ‘people of God’ in Igbo. ‘Chukwu’ = god, ‘mba’ = people or community. So my son’s name is Little Bear Who is Strong with Wealthy Intentions from the People of God. Hello , I saw your site and just thought ild say I love your sons name because its also my 15 year old sons name ,we are from the pala Indian Reservation in California.we have only met one other Nokosi at a POW WOW a few years ago.my son is drummer on a northern drum named Dancing cloud.he’s father is the lead singer so he has been on the drum his whole life.take care of your little bear my freind.if you would like look me up on Facebook.AHO. Lynn, thank you for reading and commenting! You are the only other Nokosi we know as well. There is a South African N’kosi or Nkosi, which is the closest to our son’s name that we’ve met. We specifically looked for a powerful name, when we were having him, and my wife has some distant Native American blood in her viens (as do many African Americans). And Nokosi really stood out for us. And, as you can see, the name aptly describes our very energetic little boy. From the sounds of it, your Nokosi is the same. You take care of your little bear too! There are like a hundred ‘Lynn Richardson’s so send me a friend request! Wow, little man actually looks like you. I could reel off about 15 jokes here, but I won’t. You are Chanel are blessed once again. Congrats! Congratulations!!!! I love the name and his is an absolute angel!!! Congratulations!!! he is very cute! !